At this time in the calendar it is difficult to avoid the temptation to look back at the past year and ahead to the upcoming one. I have proved unable to successfully fight that impulse so the first Directors Corner of 2015 involves some personal observations and conjectures both past and future. For the ILC, 2014 was a year of progress in many areas, but the most important activities were centered in Japan. Following the ILC Technical Design Report, which addressed the major technical issues, the question of how and where the ILC might be realised became a topic that could no longer be ignored. As such it was encouraging to see the Japanese political process engage in a comprehensive fashion to answer the question of whether Japan should prepare for the possibility of hosting the ILC. Given the scope and resources necessary for such a large project, the subject requires very careful scrutiny. Japan’s Ministry of Education, Culture, Sports, Science and Technology (MEXT) was charged to evaluate the physics justification as well as the scope and cost. These deliberations took place throughout 2014 and involved many presentations and question-and-answer sessions by our Japanese HEP colleagues. This process is now in its final stages and a “wise man” council within MEXT is now preparing their final decisions on the subject. Hopefully their analysis results in a positive recommendation. The machine design evolved in 2014 to reflect the preferred site at Kitakami. This step is a high priority and necessary to specify the conventional construction layout. A design for the experimental hall has been adopted which involves a vertical shaft as the principle access. Fixing the experimental hall layout allows the detector design work to progress unimpeded but in addition serves to help specify an acceptable topology, hence location, for the interaction point. A proposal to make the final-focus layout identical for both detectors was accepted and is presently wending its way through the change control process. In addition to the Detector Hall, collision point timing constraints also provide criteria to define the tunnel length. The exact tunnel length is a combination of the damping ring circumference, bunch spacing, and overall path length. Once fixed, the tunnel length also serves to specify the SCRF accelerating gradient, the location of the cryogenic penetrations and the linac end location. A tunnel length proposal is now under active consideration by the Change Management Board. Thus many of the fundamental machine features are now close to finalisation; the site-specific design is starting to take shape. Another notable feature of 2014 was cryomodule production for the European XFEL project. While superconducting radiofrequency (SCRF) technology was well demonstrated during the Global Design Effort phase, it is a demanding process and mass production is expensive enough that only a construction project would have the necessary resources to verify large-volume production. 2014 was the year when cavity and cryomodule production rates for the first time achieved the kind of levels needed for the ILC programme. Thank You XFEL! 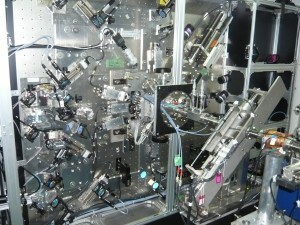 Finally in 2014, the Accelerator Test Facility at KEK, Japan (ATF2) demonstrated the complex optics of the beam delivery system in achieving a 38-nanometre vertical spot size in a final focus scenario. A linear collider, as a single-pass device, relies on ultra-small beam sizes to produce the desired luminosity. This in turn requires a very complicated system of optics. The ATF2 facility has been in operation for several years, making the kind of steady progress which has finally resulted in the validation of the TDR design concepts and tuning algorithms. This work is not over yet however, with further work needed in regard to beam intensity effects and feedback system stability. Nonetheless 2014 was a year of great progress for the ATF2 team. Looking ahead to 2015 we can anticipate another interesting year in many regards. 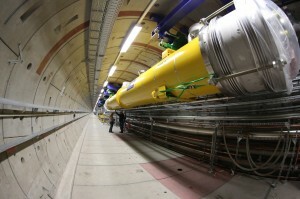 The most obvious item will be the start of the Large Hadron Collider Run 2 in the spring. Run 1 brought us the Higgs discovery, and Run 2 will be at the significantly higher collision energy of 13 TeV and increased luminosity. Obviously it is impossible to predict the results which will arise from this next phase of operations but it does have the possibility of impacting the ILC parameters in a fundamental way. A new discovery would probably be reflected in some form of optimisation of the ILC design parameters. Only time will tell but we should start to see the first new LHC physics results by the end of 2015. I also expect to see further progress in Japan towards formulating a decision in regards to an ILC project. As well as domestic considerations, increased international negotiations will surely form a part of these activities as this next phase starts. A consensus environment inevitably results in a multi-step process. We are well along this path but we are at the point where increased internationalisation needs to progress beyond the HEP community and into the political one. This will introduce another series of challenges to be faced in 2015, traditionally at least as difficult than the technical ones. As we were reminded by Kawamura-san,chair of the Federation of Diet members to promote the construction of an international laboratory for the linear collider in his message at the Tokyo workshop in 2013, politicians’ expertise in physics is only rivaled by physicists’ expertise in politics. On the technical side of things, 2015 will see the completion of XFEL cryomodule production, allowing the full production data set to allow the illumination of such issues as degradation – the loss of cavity gradient when placed in a cryomodule – where sufficient statistics were heretofore lacking. The site-specific design work will continue and I expect the first complete ILC footprint using the Kitakami site. Slowly resources are accreting into the project and hopefully 2015 will see work resume in the positron system and damping rings area and continue in the other sub-systems. So we enter 2015 knowing that this will be a very important year in many ways in the evolution of the ILC. I expect that we will emphasise the international part of the name and a significant feature of the activities will be political. As always, only time will tell how the programme will unfold. Mike Harrison is Associate Director for the International Linear Collider in the Linear Collider Collaboration.